Like many New Yorkers, I have a healthy fear of the Upper West Side’s Fairway Market (the Harlem one isn’t so bad, but the Pulaski Skyway is technically closer to my apartment). Sure, they sell everything in the world, but from my rough estimation, the store contains everyone in the world at any given moment and it turns out, the quickest way to turn me into the kind of person with plumes of smoke pouring from my ears as I white-knuckle a shopping cart is to ram into the back of my ankles with yours. Ahem. So yes, I don’t shop there very often. But last weekend! Last weekend I went to their new store in New Jersey… ah, New Jersey with its wide-open spaces and aisles wide enough for two shopping carts in opposing directions and acres upon acres of refrigerated produce space. I about lost it when I saw more than a dozen varieties of citrus and suddenly this citrus salad idea that I had been kicking around in the back of my head became The Next Thing I Absolutely Had To Make. I’m a sucker for a colorful, lettuce-free salad, and in warmer times my defaults are this Mediterranean Pepper Salad or anything that allows me to go nuts with purple carrots. But in dreary January, these pink, orange and red-celled wheels of citrus were a sight for sore eyes, this fresh platter a brief and delicious respite from considering things to braise, roast and cook for hours. My mind turned to cruise ships, damp island breezes and marshmallow wrists and legs in tiny swim trunks and for a few minutes I completely forgot we’ve got months of winter to go. I call that a salad miracle. Place your red onion in the bottom of a medium bowl. Nest a strainer over the bowl. Prepare your citrus fruits by beveling the stem end of one, cutting enough off that you reveal the pith-free flesh of the fruit. Repeat on the other end. Rest your fruit on one of its now-flat surface and begin cutting the peel and pith off in large, vertical pieces. You want the fruit’s exterior to be “white”-free. Spread the fruit slices out on a platter. Scoop out the onion bits (a slotted spoon or fork does the trick) and sprinkle them over, leaving the juice in the bowl. Whisk one tablespoon of juice (this is all I had accumulated) with red wine vinegar or lemon juice, Dijon and olive oil. Season with salt and freshly cracked black pepper. Drizzle the dressing over the citrus, sprinkle with feta and mint, adjust salt and pepper to taste, serve immediately and daydream of warmer places. What gorgeous photos. I love citrus salads, especially with mint. Chopped olives are nice too. This is like a little salad from heaven! I love all things citrus. what a good idea…i never would have thought to mix feta with citrus, but will have to try. ps Fairway is a huge nightmare. i used to go super-early or super-late just to avoid the masses. all the same, it beat the crappy overpriced Gristedes in my Washington Heights neighborhood. Deb, this is GORGEOUS! I accidentally bought a “Casa Casa” orange last weekend, cut into it (after a few glasses of wine) and thought I’d bought a grapefruit! Have you tried them? soooo yummy! Hi Sarah — Yes, there is a cara cara in here. They’re very sweet with a nice flavor but lack the bite of my favorite citrus, grapefruit. Love the salmon color though! I was actually looking at the pictures of this salad on Flickr when it popped up on twitter! It is really stunning, especially in this very dirty-snow gray week/month/season. Bravo. Darling…you haven’t made anything fattening or bad for us in simply ages! I’m so sad! I’ve been trying to get away from salads based on lettuces. I hadn’t really thought of feta with citrus though. My favorite citrus salad is oranges, oil cured black olives, rosemary, onions, and ricotta de salata. I think its Michael Chirarello’s recipe but I’m not sure. I’m not typically a huge citrus fan, but you may have turned me with these stunning colors. The barley risotto and tomato sauce were recent hits in our house. Perhaps I need to give this one a try as well. Oh beauty, beauty – the citrus looks positively jewel-like on that plate. How completely refreshing. That gorgeous collection of tropical color is enough to transport me to an island oasis. I have the fresh mint growing on my windowsill, and feta in the fridge. Now all I need is a box of fruit. To the market tomorrow! Oh, what a great salad idea. I think I am mostly attracted to it because we are having a lovely warm snap (is that a phrase? I don’t know) here in Austin and mint and orange seem like a perfect treat. Hardly salad-y at all! I love your blog…in case you hadn’t noticed. I want to eat my screen. And this is EXACTLY why you are a 2010 Bloggies nominee – congrats! It is as though we are meant to be, this salad and I. Not only am I in the throws of First Trimester horror that has turned me off to all cooked foods, but I happen to live very close to the Fairway here in stinky ol’ Jersey. I think the mint is a perfect accompaniment to this salad! It looks absolutely beautiful and I’m sure it tasted oh so refreshing! By the way, I LOVE Jacob’s “marshmallow” wrists! SOOOOO CUTE! That is gorgeous! Mark Bittman’s column this week was something similar. Both are so inspiring. Ha – I noticed your “serve immediately” note at the bottom of the recipe and wanted to reiterate that! I made a similar salad, though instead of mint and feta it was basically honey and, oh, more honey. I must’ve made it in advance by a few hours, because by the time it was served, it was SWIMMING in the citrus juices. Tasty, sure, but it was a bit less pretty, a bit less graceful. I can’t find blood oranges in my grocery stores!!! Do they have them at Whole Foods? I may have to make a stop there, I miss my blood oranges. Salad looks delicious. Mmmm… fresh produce. We have slim pickin’s here in the desert. Can’t wait for summer! Heather — I’m nearly positive Whole Foods has them. Lindsay — I sometimes hate to mention my favorite things as I get a lot of “but I can’t find that around here” comments — we’re spoiled in NYC and I don’t want to rub it in. Nevertheless, if you can find it, Bulgarian Feta is my favorite, followed by French. Oh I am so going to eat this tonight. The first non-leaf salad I had was last summer. It had celery and oranges. I thought it would be gruesome but it was 900 degrees and there was no way I was turning out anything hot. There was way too much juice involved though. Thank goodness you don’t call for that. Wow, I can say that this is unlike any salad that I have seen before. But really, anything with feta is good in my book. What kind of feta do you use? Goat or cow? I would love to know what your favorite is! Beautiful! Perfect time for such a salad, lots of Vitamin C!! My second citrus salad recipe in 24 hours!!!!!! 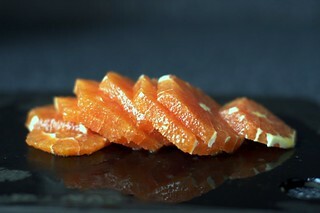 Photos are stunning and it would be great with some sliced kumquats!!!!!!! How yummy. Kiss to J.
Citrus is one of my favorite ways to brighten my winter days. It is such a gift to have these colorful and zesty fruits at the peak their season in the frigid gloomy winters. This looks like a wonderfully refreshing and beautifully appetizing salad. I’m not sure I’ll ever make this (here in indiana we’re limited in our citrus choices) but I might come back over and over again to look at the beautiful slices of fruit that do indeed make it feel like summer. Looks delicious! Thanks for sharing! My local SuperTarget has an awesome array of citrus on sale this week! Several varieties are only 39 cents each. Among them were Cara Cara and Blood (aka Moro) oranges. I bought some of all of them. 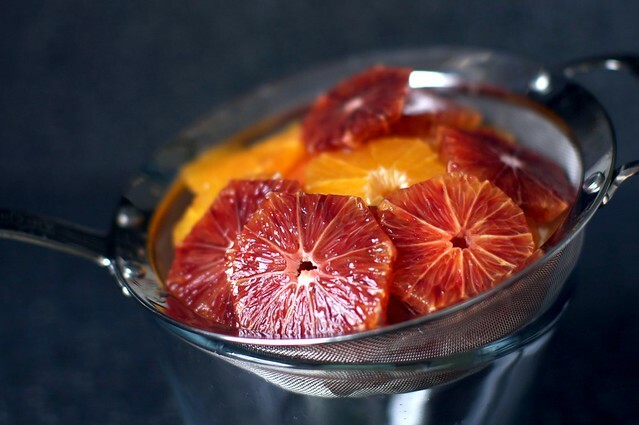 We were already fans of Minneolas and Clementines, etc., but oh, those Blood oranges. What a flavor! My 14 year old son loves them but my 9 year old son couldn’t bring himself to try a taste. He said they don’t look right! 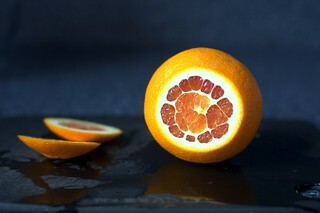 I agree with you about the Cara Cara’s; they’re a beautiful pink color, but not the flavor I want when I peel an orange. Gorgeous, gorgeous salad! I love the way you write. You make everything sound good. OMG, that looks so incredibly fresh and tasty! Definitely have to try this one. Thanks for the inspiration! So pretty + cara cara oranges are my most favorite. They are like the sweet lovechild of an orange and a grapefruit. Makes me feel like summer. This is an edible mosaic and it’s just lovely! Just looking at the pictures was like an escape from winter. I must make this as soon as humanly possible! I love how flexible this recipe is. I have blood oranges and regular oranges already in the house, so I am halfway there! It will make a great light addition to dinner! that looks so yummy and gorgeous! i love using mint in salads. Ok, Deb, you’ve driven me to comment (first time, I think). First it was to say that Bittman did something similar recently, but someone already pointed that out. I wouldn’t be posting for that, though. What motivated me to comment was this – those are some of your best (non-Jacob) photos that I’ve seen in my time reading your blog. 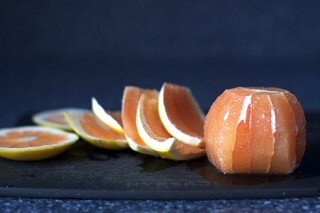 The final result pics are fine (up to your normal – good – standards), but “all my citrus lovelies” is an amazing shot. The shine of the blood orange, the glint from the steel, the color contrast between the fruit and the countertop and the glass – amazing. Plus, it’s a fun little smiley face if you look at the two in-focus “eyes” of the slices, a triangular nose formed by the negative space, and the lip of the bowl as a mouth… cute. Very very nice work with those photos! I’m looking for a photo in my collection to enlarge to poster size for my kitchen wall, and I may have to steal this idea and recreate in my own kitchen. Thank you again for the inspiration and the yummy recipe! Beautiful photos! Perfect for January. That Fairway is not 5 blocks from my old apartment and I found that if I had not had a glass of wine first there was no way I could tolerate it. I started shopping at the little westside market next door instead. Now I only go for certain things I know I can’t find anywhere else, like porcini mushroom bullion. I work near the 125th St Fairway and find it best to sneak out of work around 10-11am when there are fewer people with exciting shopping cart driving skillz in the store. Since I’m on foot, I only buy what I can fit in a basket and I fairly zip around the place. You’ve inspired me and I’m going to have to take a trip there next week – I refuse, except in extreme circumstances, to go during the weekend. My great advice: go on weekday evenings during the spring/summer/fall and then cross the street to the park by the river, eat bread and cheese, yogurt and honey and watch the sunset. My aunt in NYC lives about one block away from that upper west side Fairway Market. I’ve never bought anything there (it IS super crazy) but we enjoyed a nice brunch upstairs once. 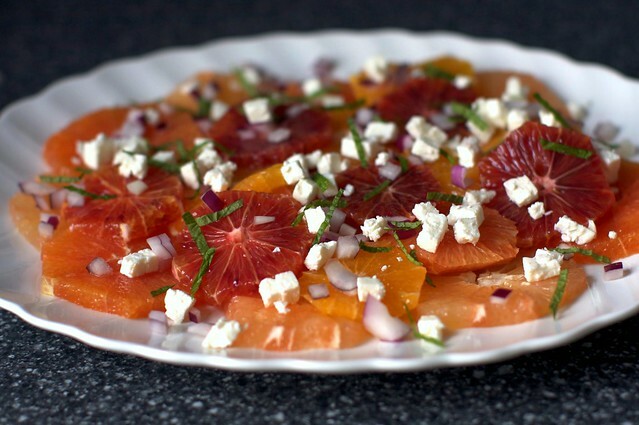 :) This salad is absolutely gorgeous, and I love blood oranges! Now I am intrigued with casa casa, which I don’t think I’ve ever had. Great idea, I will try it this weekend. And I am not at all afraid of Fairway at 74th, I sometimes go there before a snowstorm just for kicks. Mmm, I saw this in the times and was thinking about making it, but now I think I have to. Was this the Paramus fairway? I still haven’t been there even though it’s ten minutes from me. Good to know it’s not AS insane as the others. Foy Update – Cook. Garden. Write. Repeat. This sounds delicious. I love a good citrus salad. Might I suggest some fennel perhaps? A little anise flavor with a lot of crunch, I think, would be delicious. There has not been a day without a Jacob photo. Wowie wow wow! Who cares what it tastes like! After seeing your pictures, however, I finally know how to peel the dumb things for a pith free salad. So still totally worth it! When the time comes, I’ll be set to impress. Beautiful photos of the citrus, Deb. The colors are so vibrant! Love it. Oh, that first photo is just gorgeous. Would I like some citrus salad? Yes, please. Although, if it’s plated like that, I probably wouldn’t be able to eat it, for all the looking. Thanks for the inspiration! No lovely oranges, no diverse grocery stores, but a lone pink grapefruit, some red onion, feta and a head of romaine more than made up for it. The salad is fabulous, much more than the sum of its parts. Your pics in this post are exceptionally beautiful! Mark Bittman had a salad very similar to this last week, only with tarragon. The feta and mint look like excellent additions! I can think of nothing better to brighten a rainy winter day. LOL – the bloodsport known as UWS Fairway! It’s been more than two years since I’ve gone there, the last time being when I engaged in a verbal beatdown with one of the store’s excessively (even for NY) rude personnel; I walked out leaving $150 or so’s worth of merchandise on the checkout belt without ever looking back. Strangely, I have been thinking in the last few days of going there – the 125th Street location, that is – to stock up on supplies for the Jets game viewing. The Jersey location sounds glorious and is news to me (as is the new Costco on E. 117th St., which I just read about somewhere and which is also getting rave reviews.) Your blog is amazing, BTW! That salad looks so beautiful! And you were right by my neck of the woods! I love that Fairway, especially on a weekday evening, it tends to be pretty easy-to-manage, crowd-wise. My tongue began tingling the second I saw that first photo! Ooh, do I want this and now! Can’t get enough of that delicious babe! When I saw this post I decided I just had to have the pink grapefruit sitting in my fruit drawer. Now my fingers and keyboard are a sticky tart mess but I am totally inspired! Love the combo of tangy citrus with salty feta. Really, is there anything more beautiful than the color of the citrus in that salad? And in addition to their beauty, they are what I crave in January. Must have to do with all of the dry air, but I cannot get enough of them. Pickling those onions in citrus juice is a great idea! Orange and onion salad is one of my very favorite winter salads. In fact, I often use orange segments in tossed salads in the winter instead of tomatoes. So good! This platter of yours is my favorite way to serve fruit for brunch in winter. I usually don’t use the onions on my citrus platter, but do add some blackberries just for contrast. Love your blog, your recipes and your photos! One small comment though: feta actually has a Protected Designation of Origin (like many well known french products…) by the EU. So technically there is no Bulgarian or French feta… just Greek! Sorry but it would be like calling spumante champagne and blue cheese roquefort – kinda not the same right???? The salad looks really beautiful… I agree that citrus do make Winter less harsh when you have access to good citrus, that is. What about adding a little more crunchiness to it? Hazelnuts? Pine nuts? Oh, delicious! How did you get your feta into those darling little cubes? I will sloppily crumble mine, but I don’t think anyone will care. Mint in anything, especially salads, always wins with me. I’ll have to check out the new fairway. I go to the one on 74th street only on weekday mornings. Otherwise it just makes you think there is something wrong with the world. I had no idea I wasn’t the only person who hated dealing wit Fairway, I though it was just the fact i had moved away and was used to aisles you could walk through and not having other shoppers looking for blood. When I was in college I spent a summer working in a jewelry store across the street and went for lunch every day. I had the, ahem, pleasure of being cut in line by Tony Randall there. I love fruit and feta salads, I made one this past summer with watermelon, pineapple and basil. I will try your version soon with local goat feta. Perfect salad for winter! You captured the essence of the season. This looks so refreshing! What a wonderful pick-me-up salad from the dreary days of winter :) Simply gorgeous photos. It’s all about the Brooklyn Fairway. Nice & big, not too crowded and on a nice day you can sit outside and gaze at the water while drinking coffee. And there is parking. It’s lovely. 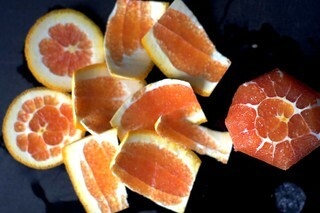 Completely craving oranges and grapefruit now. Fantastic photos! Brill! Love how you use the y’all when saying, “y’all know I’m from Jersey.” It is to laugh. Found blood oranges, grapefruits and tangerines at my beloved SUPER KING market, crazy cheap. They rotate their world-of-fetas to be on sale for $1.99. This week it was the Danish. Very salty but good. This is an awesome recipe that is very simple but appears to be complicated and fancy. Those wishing to impress take note! It must be fate, I have a fridge full of cara cara and blood oranges. They’re just perfect this time of year, bright and flavorful. Thanks for including some gorgeous healthy eating ideas, we all need inspiration to eat better. Ha! I’ve never lived in NY, but I know that Fairway! My Dad and I (we both live in Texas) spend a week every October staying at the Beacon Hotel across the street and hitting all the museums. We get a suite with a kitchen and shop at Fairway so we don’t have to eat every meal out. It is *crazy*, but I just thought we were getting the authentic New York experience. Looks delicious, almost too pretty to eat. Save the peelings and make candied orange peels with them. A beautiful salad with very beautiful pics….have tried ur crust 102 and rugelach tips and mus say u rock as usual!!!! I had a salad so simillar to this last night at the Union Square Cafe! It had all the same ideas happening with a slightly different result: It was all cara cara oranges sliced just so, the mint was there, they used ricotta salata instead of feta, perhaps to keep the cheese flavor a bit more in the background, there were lovely toasted pine nuts, and perhaps some garlic though my memory may not serve me. It was incredibly delicious. Deb – were you aware of such a salad? Ezra — I had no idea, but clearly great minds think alike. We’ve actually never been but now live close enough to it that we’ve been meaning to get there. P.S. I’ve got a fennel seed vinaigrette on this salad — try it on this! I also hadn’t realized that Mark Bittman had a citrus salad this week too! (I have barely read the food section or, um, blogs since the tot was born. Shh, don’t tell.) Clearly, New York has citrus on the brain. I like the tarragon idea in his but would still choose mint first. ah- no garlic, but a fennel vinaigrette. Feta goes well with every kind of salad in my opinion (well, I’m Greek, what am I gonna say). And the red onion. I’m a sucker for both of these ingredients. The options for citrus fruits are so many, it’s incredible. I haven’t tasted cara cara, I don’t think they’re available where I live. This is absolutely gorgeous! Beautiful picture! It reminds me of walking through the citrus groves in Sicily! I want to make it as soon as possible to bring me back to my vacation there! Thanks so much for sharing! Those colours pop right off the screen. How gorgeous! Feta + mint is always a delight. We just done it and it was amazing!!! Love it! Thanks for the fantastic idea. From an italian living in Switzerland with a canadian girlfriend! I don’t know about the Jersey contempt either. I miss NJ terribly, and there is a reason it is called the Garden State. Sure, if the only part of Jersey you see is what you pass through coming from Staten Island to I-95, then of course you’re not gonig to see anything. But a bunch of people think that if they’ve driven I-95 then they know the state. But if you’re in the know, there are huge swaths of beautiful countryside, great hiking among wildlife (just beware the bears) and wonderful farmland (and farmstands). If you’re willing to trek all the way to New Jersey to shop at Fairway, then while you’re there you shouldn’t miss a stop at the Japanese market Mitsuwa (formerly Yaohan) in Edgewater. And if you’re traveling through NJ between PA and NYC, then try to make sure your route has a pit stop at one of the Wegmans supermarket. If you like Fairway, you’ll love Wegmans. Yep, people think they know New Jersey. Good god, this looks good. I think the trouble I would have with making this salad would be wondering what everyone else was going to eat. Cause I could devour the entire thing in a matter of minutes. I love citrus in salads. Have you ever tried fileting the fruit out instead of cutting in slices. I remember my dad teaching me how to do it years ago and then you get rid of the white part of the citrus. I usually do some both ways when I make citrus salads. Yours is beatiful. Wow, I have never heard of Cara Caras, and I think of myself as well-informed! Thanks for the info, I will have to look out for them. Absolutely gorgeous pictures. You should put the first batch of 4 on smittenprints. Really lovely. And just last night I made an avocado, orange, and onion salad! Love citrus in a salad, especially (only!) in winter. And baby cuteness! My day is complete. Gorgeous! Such beautiful colors, and I’m in possession of a 5# bag of cara cara oranges… Thanks for the lovely inspiration! Beautiful salad. Simple and delicious! Why am I not getting pictures of little Jacob the last few posts? I miss them. Made Bittman’s citrus salad last night to serve with Beef Bourguignon. Yum! I’ll try yours next. What a nice splash of brightness in my otherwise dark dreary Minnesota day. For those of you who miss the best part of the post –baby pictures–they are there, every post. Just look for the descriptive words, such as marshmallow wrists, monkey and the like, then click on those words and the link will take you to grand prize…baby pictures! And they are there, in every post (did I already mention that?). Deb, this description is so perfect: “these pink, orange and red-celled wheels of citrus…” I feel you read my mind….. that was what was in the back of my mind last week when making my bowl of sliced citrus fruits. Must confess I never would have thought of adding feta or red onion even though they were right there in my fridge. Alas, I have no mint here though I have all the other ingredients. The tarragon will have to substitute. Has anyone tried dried mint? I just cannot afford buying fresh herbs, but will get a plant in the spring as I see mint in more and more recipes. ahhh Fairway Market… I used to love shopping there when I lived in NYC. although I was a student back then, and could shop on the off hours. I used to trek in all the way from Brooklyn (until I discovered the co-op!). The salad looks delicious! I love the Fairway in NJ! Sometimes I go there when I don’t even really need groceries, just to sample all the olive oils and pick up something I haven’t tried before. Salad looks absolutley stunning! Congratulation on the nomination!!! You really do deserve it! I adore Fairway. Absolutely adore it, but always go to the Harlem store because for me it’s more convenient and the West Side one is a bit scary. This salad sounds lovely though and I may need to try it soon. Thanks so much for sharing! a) these pictures are so gorgeous I want to hang them on the wall of my kitchen. b) I rhapsodized about the beauty of new jersey supermarkets on my blog, that’s how much I agree with your assessment. c) I get total road rage when I push a cart through a crowded supermarket and my frustration causes me to forget to buy at least one thing off my list. d) I’ve never been in fairway because I’m scared of it. say what you will about Jersey, but our Fairway is really super!! The Red Hook Fairway is huge, bigger than the Harlem one, and far less crowded than the UWS one. I’m getting ready to sit down and sample my own version right now! So grateful I have some fresh mint growing in the window and so grateful you shared this recipe! What about the Brooklyn Fairway although must avoid Sat and Sun from late morning on. In nice weather sit outside and watch the ferry and boats cross the harbor while you drink your coffee. It’s even landscaped. Sometimes you can’t believe you’re in NYC. Looks and sounds gorgeous and – I realize I am not the first to mention this fruit here – brings to mind my absolute fave, most ridiculously easy toss-up for the hottest days of the year: watermelon, feta and mint. C’est tout, c’est si bon. whoa those are beautiful! I love seeing all the colors that fruits come in. Seems that the commercial grocery world likes to pick a color and say that all carrots are orange and all tomatoes are red when there are so many gorgeous colors out there. I live in on the Coast in northern Maine and luckily had just been to the grocery store ( a once/every 3 weeks ordeal). I happened to have goat cheese, pink and yellow grapefruit, oranges and some clemtines. Since I didn’t have blood oranges… I used a pomegranate. It was heavenly! A perfect accompaniment to some fresh scallops. It was a huge hit! Thank you. Thank you! I love color, vivid vibrant colors in my food and this salad brings me all of that. A tasty, colorful salad to go along with the sushi my son made. I substituted shallot for the onion. Beautiful photos! I am looking forward to a citrus salad in my own kitchen. The photos are extra lovely this time. So lovely they inspired me to make a citrus salad too. I added a little bit of spinach to it and a couple mushrooms and a shredded carrot. I used a rio star grapefruit, two different types of mandarins, a cara cara, honey tangerine, and a cutie. I live in Texas and we have Central Markets, not really sure what to compare them to, but I pretty much picked up two of every citrus fruit that looked neat. It’s “citrus fest” so there were a bunch. Yummy! Thanks so much! I too have a love/hate relationship with the UWS Fairway since my early days as a Manhattenite when the produce was so bad in my local grocery that I would treak from the West Village to the UWS to carry back bags of better produce from Fairway (as well as cheese, marinated sun dried tomatoes, chocolate covered halavah, etc.). There is now a ginormus Fairway in Red Hook, Brooklyn also (with suburban like big aisles, etc.). If you haven’t been to that one yet then you should definately check it out. I assume you can drive if you were going to the one in Jersey, so Red Hook should just be a hop, skip and a jump for you by car. If not driving then subway/bus and NY Waterway Ferry from Wall Street will also get you there. I do go on occassion and it is a much less like a subway car during rush hour experience then the one on the UWS. my my, that last picture was a burst of summer. and agreements all round with lettuce-free salads! An Asian salad of Malay origins is called Rojak (literally, a mash-up of everything), which contains fried Chinese dough sticks (you tiao), pineapple, cucumber and bean sprouts mixed in a sweet, sticky dark sauce. It’s quite heavenly and perhaps a little exotic compared to this burst of summer! We had this tonight as a side dish with jasmine rice and bbq’d chicken that had been marinated in store-bought sweet chili sauce. It felt like summer. Exactly what i want to eat right now!! Yum!! If this doesn’t take the chill out of winter, I don’t know what will. Mint and feta is such a fantastic way to dress up fruit. Normally I put it on my watermelon in the summer, but this is the perfect winter version. Thank you for this! What a beautiful presentation and so simple to prepare! What a delight to prepare and enjoy. To those who can’t find ‘blood oranges’ another name is Moro oranges. 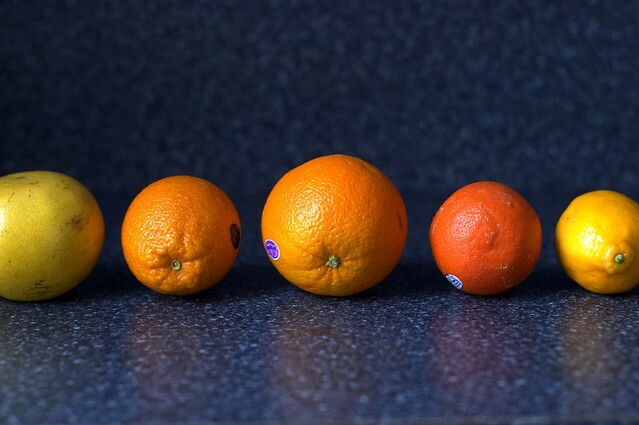 My children prefer them to the naval oranges. I like them all as long as they are juicy and tasty. Feta and mint are my favorite combination. Lovely on many vegetables. I have never tried them on fruit, but yum, this sounds delicious. Made this tonight to pair with an asparagus risotto, and it was the perfect match! My roommate loved it, too! Made this last night to serve to guests with brisket and smashed potatoes. Everyone loved it. Many thanks, Deb! I love fresh salad like that. And the bright colors make it even better. Oh, the book club chicks loved this! The best citrus I could find was blood oranges from the store and navel oranges from my backyard…it was delightful with the soup served packed with veggies. I added a little agave to the dressing, and used white balsamic for the vinegar. – Never go between 5 and 7pm. Ever. – Sunday afternoon is equally as bad. – It’s very empty after about 8 or 8:30pm. – Make friends with the staff at all the counters, they will give you free samples and if you are a neighborhood regular, they may even sometimes let you cut the lines. The cheese guys are the best ones to befriend. They will remember what they sold you two weeks ago and if they don’t, give you tastes until you do. – Don’t ever use a shopping cart, that’s certain death. And lastly, despite having eaten more fried bar food during football today than I should ever admit on a blog, I’m salivating over this salad. And sad that I no longer live a stone’s throw from Fairway, aka food heaven. Oh I’m thinking this salad is delicious but the photographs are showstoppers here. Bravo!!! I love citrus right now. It has an instant transport-to-warmer-weather quality. And feta pairs with so much! Need to try it here. What a gorgeous, juicy, sweet and salty delight! Can’t wait to try it. perfect timing all of my citrus trees are bursting with fruit. The Citrus Salad–What a wonderful treat and it is pretty as the picture. I made it last night and my husband and I ate all of it. Somthing I will make again and again. When I was a little boy, my father used to make a hangover salad that was oranges, jicama, and habanero peoppers. We kids got to eat the oranges and jicama and he saved the accumulated juices stewing in the habanero pepper for himself (that was the cure). As an adult, I adapted his recipe and turned it into a salad. This is an even tastier play on that salad. I just ate it and it was delicious! What a beautiful salad! I’m craving sweet, juicy fruits right now. Wowzers! I want to eat up that entire plate – great flavor combo! Made this last night. My notes: for more juice, squeeze the end pieces of rind over the onions; and those vertical cuts of rind — squeeze the juice out of them by pressing/running your thumb over the little bit of citrus on them. You’ll be surprised how much juice you get. The down side is that my white shirt is now speckled with blood orange juice, so wear an apron! Haven’t had grapefruit in years. We used to eat them with sugar. The comparative bitterness was quite a jolt. I think next time I’ll let them set a couple minutes by themselves sprinkled with a little sugar (or salt?) to take the edge off. This reminded me of Nigella’s watermelon feta salad which I love. Thanks for another keeper, Deb! No telling how many of your recipes I make over and over. The Leeks and Mushroom Quiche is on the menu today. BTW, what size tart pan did you use for it? Fairway on the West Side is the only grocery store I have ever experienced that has shopping cart gridlock. They should install some traffic lights at the end of the aisles. But they really do have an amazing selection! I’m a Chicagoan who discovered the West Side Fairway market this past Sunday night around 10 pm…loved it, and no crowds! We could move after this discovery, amazing. And the citrus looks delicious as well. Oh, I looooove that Fairway! It’s kind of rush to shop there. I recently read an interview with a triathlete (triathalete?) who said something about the swimming portion to the effect of, “every single person in the water is getting just as clobbered as you are, so you might as well not waste energy kicking back.” That’s kind of how I feel about the Upper West Side Fairway. Plus, I get to buy food, not compete in a Triathalon. Lovely photos and lovely blog. I’d have to try your greens-free salad. Thanks for your post!! just made this! perfect for a dinner party on a VERY snowy day here in DC. I made this salad friday night for guests. Either my citrus was too juicy, or my knife not sharp enough, b/c I couldn’t cut the fruit into nice little rounds. Instead i opened up the sections and served them in pieces on individual plates with the dressing drizzled over them. I didn’t use the feta, but it got rave reviews without it. This one is a keepr! I used pink grapefruit, blood orange, minola, and satsuma and only the grapefruit held its circles well, but it didn’t matter. The beautiful hues radiate out from under the feta and mint and make you want to dive in head first. I’m eating it right now and loving it! Made this last nite for a dinner party for thirty. It looked great on the table and was very tasty. Will definitely make again. My co-op had navels, cara cara, and one other type of orange on sale this weekend, so I made a three-orange batch on Saturday night. How delicious, even with the substitution of one drop of peppermint oil for the fresh mint! I’m adding this one to my winter foods stash. Thanks, Deb. 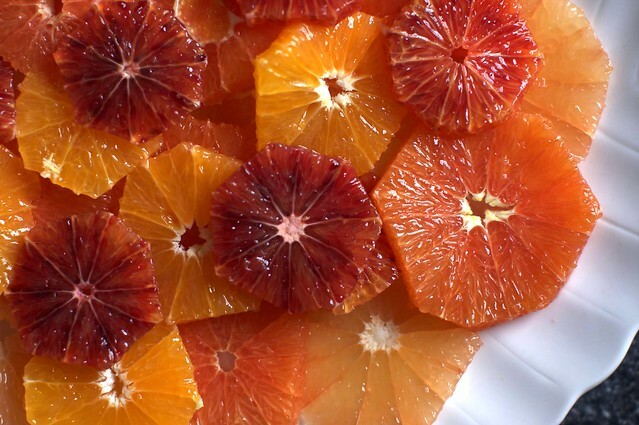 I am crazy about citrus right now, making salads, marmalades and tarts and this recipe looks interesting to me too, so zesty and colorful. This looks amazing. After being snowed in and running out of fresh fruit for a few days, anything fresh looks great. This post made me happy and sad at the same time. Happy – Two weeks ago, I walked through the Park to go to the UWS Fairway at around 2 in the afternoon on a Saturday so bleak, there were few people around. I mean, the only people I could figure out who were in the Park (from their accents) were foreign visitors. Since I came out on the West Side at 81st Street, I decided I could afford to take a little time and pop into Zabar’s too. Well, the reason there was no one on the street was because every single person over the age of 18 who lives in NYC was either in (a) Zabar’s or (b) the UWS Fairway. I couldn’t believe it. Who knew one could teletransport to each place? Sad – Three years ago my darling father, who lived in Paramus, died one month shy of his 84th birthday. Fortunately, he had a very short illness, and was great up until then. The last picture I have of him is sitting at the table of my friend’s house in Vermont six weeks before he died, happily eating a delicious lunch. Alas, the Paramus Fairway opened after he died. He would have LOVED IT! I made this last night! it was so delicious and a total breath of fresh air. i have leftover i’m bringing for lunch today and feel so virtuous eating all that vitamin C! thanks for another great recipe. MMMMM! We just had this for dinner, and over dinner I made a commitment to finally commenting when I try one of your creations. We used blood orange, grapefruit, cara cara, and minneola. And shallots instead of onion. I love everything you post and have introduced everyone I meet to the website. Thanks for another delightful meal! I just have to tell you, I have dreams about this salad. I saw the recipe a few weeks ago and have been wanting to make it ever since. Yum!! Any suggestions on about how many this would feed? Thanks! @kim, it just depends how many pieces of fruit you use, and how big they are. I made this the other day for a breakfast salad with french toast, and a medium grapefruit, and medium orange were enough for 2 people, plus extra for lunch! I had commented earlier (#152). I got new knives and the fruit cut beautifully! just had this and it made me feel like summer… in the messy half-snowy streets of nyc… delicious, thanks! This totally inspired me the other day – finally made the salad tonight. I forgot the mint, but included thinly sliced fennel and some oil cured black olives (pitted) with a blood orange and some random seedless tangerines I needed to use. My dressing was a mix of balsamic and cider vinegar I marinated thin red onion slices in for a couple of days, olive oil, pepper and touch of salt. Great blend of flavors – thanks for the idea – not the first one you have given me! I have been meaning to tell you that I made your citrus salad as my contribution to my sister’s Thanksgiving dinner last year and it was a huge hit with everyone. My youngest nephew had 4ths–so he could clean up all that lingering feta. I think it may become a standard for our turkey tables. Thanks! I’ve made this recipe once or twice every winter since you’ve posted it, and it never fails to be a hit! The flavors work so well together and are a refreshing change from heavy winter meals. Plus, it’s just gorgeous! Thanks for sharing such a great recipe. Fairway: I go during the superbowl. Just a quick note to say that I took the hint from your facebook feed last week and made a version of this for a brunch I hosted this weekend. I forgot to buy mint and I was already using feta in the frittata (a riff on the one in your book), so I just did the dressing + fruit and tossed it with some baby greens and added some toasted almonds. The salad was a hit and my guests took all the leftovers home, leaving me to crave whipping up another batch for lunches this week. Thanks as always! I love this salad, gorgeous to look at and taste! I find it hard to keep the slices intact, but that’s OK, since a full orange slice is harder to eat in one bite. It’s not quite as pretty in partial slices, but almost. I also leave out the grapefruit. Miss the taste, but the membranes are often so tough, they make it hard to eat. How would you modify this to make it a dessert? It is so beautiful and I was assigned to bring a fruit dessert for Christmas. I think a variation on this would be great. Do you have any suggestions? I think this could just be served with dessert, or you could swap the feta with sweetened ricotta, mascarpone, creme fraiche or yogurt dollops. You might also like these broiled oranges. Just a quick note that this isn’t currently listed in the “Citrus” category of recipes (I was looking for other citrus ideas, but the photos of this salad have always stuck in my memory!). I make this salad every year for a girls weekend getaway in Tahoe. Each of us are responsible for a meal or element of a meal. The ladies ask for this salad each year. It’s a great winter salad. Made a variation of this as part of Mother’s Day brunch this year. I wanted a slightly sweeter citrus salad, so left out the mustard and vinegar and drizzled with just a touch of agave (my citrus was a bit more tart than anticipated). Otherwise I went with basil instead of mint, but kept the preparation and presentation, the feta, and the S&P. Very well received! Hi– I love your recipes but is there a way to print them without printing all the pictures? I know I can cut and paste– but is there another way? There is a print icon that leads to a print template at the bottom of each recipe, where it says “DO MORE:” You can also click CTRL + P from any recipe post and it will take you to a streamlined print template. YUM!!! I made this with three oranges and a pomelo, and lemon juice rather than red wine vinegar. I was concerned that the onions and dressing might mar the otherwise perfect pairing of citrus with mint and feta … but everything melded delightfully. Everything combined into something complex and original, but in a subtle way. Such a good mid-February pick-me-up!!! Is there a secret to slicing the fruit so it stays in pretty rounds? they keep falling apart or juicing themselves completely as I do it.